The Browns Valley facility on the Yuba River consists of several components: a diversion channel off the Yuba River, the fish screen and structure and a diversion lagoon from which water is pumped to the District’s open and closed conveyance facilities. The Yuba River is a dynamic waterway, often meandering within its banks and becoming braided during lower flows. The diversion or intake channel flows parallel to the Yuba River for approximately 4,000 feet. The purpose of the diversion channel is to maintain river flow and depth at the screening facility. Water in the channel is either drawn through the screens or passes on through the channel and back into the Yuba River. The velocity provides transport for the fish screen past the fish screen facility. The water velocity normal to the fish screen or approach velocity is minimized to prevent entrainment of fish and debris on the screen face while still providing the required diversion capacity. The approach velocity can be modified by adjusting the flow control baffles, located immediately behind the screens. The sweeping velocity is controlled primarily by the quantity of water flowing in the Yuba River. Water passes through the facility via ten screened bays, each with a surface area of approximately 28 square feet. The screen material consists of stainless steel wedge wire. The screens are positioned at a 35-degree angle from the vertical. The screen panels are kept free of debris by a pair of brushes on an automatic drive system. The screen sweep operates continually during the diversion season. The screening facility is anchored by twelve piles. The round steel piles were drilled to bedrock and filled with concrete. The structural components of the facility are comprised primarily of steel beams and plates. The abutments consist of stacked gabions, stepped into the existing grade. The gabion abutments are covered with both gunite and a protective polyethylene coating to provide a positive flow barrier. Water flowing through the screens passes into a lagoon. An elevated pumping station lifts the water from the lagoon and into a nearby conveyance facility for distribution to water users. The maximum design diversion capacity of the facility is 65 cfs. In order to divert the full 65 cfs, the minimum required flow in the Yuba River is 500 cfs. When less than 500 cfs is flowing in the Yuba River, the diversion capacity will be less than 65 cfs. 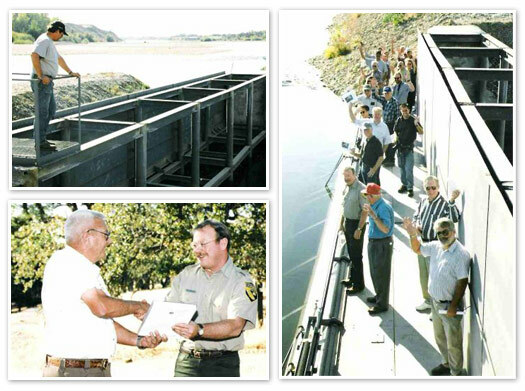 Former Manager Winchester dedicates the facility to John L. Nelson of the CA Department of Fish & Game.